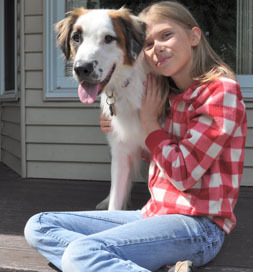 Lisa Dechert waited anxiously as the shelter worker brought in a Setter/St. Bernard mix named Rooney. She had met the dog the day before, but today was the big challenge. With her was one of the family’s cats, White Paw. Would Rooney pass the White Paw Test? Rooney pauses for a photo and a hug. Lisa certainly hoped so. She hated to see her daughter, Taylor, disappointed again. The girl had desperately wanted a dog for a long time, and when she turned 10, her mom decided she was old enough for the responsibility. Their first choice, a dog at another shelter, already had a long line of potential adopters ahead of them, so Taylor went home from that adoption day very disappointed. Later, they adopted a dog that turned aggressive once he arrived at their home – and he definitely didn’t like cats. With a sad heart, Lisa had returned the dog to the shelter. She had waited several months before browsing on Petfinder again. She found several dogs she wanted to meet at the Geauga County Dog Shelter, so one Sunday, they headed to Chardon, OH, where it’s located. When a staffer brought Rooney to meet them, he was overjoyed, but another dog there had been just as excited. When they took Rooney on a trial walk, he pulled hard on the leash, which reminded Lisa of the dog they’d had to return. That worried her. “Does he get along with cats?” she asked. The first dog they had visited with at Geauga County Dog Shelter didn’t. “I don’t know,” the shelter worker said of this one. “They said we could bring in one of our cats to see how he responded, so I decided I would give that a try the next day,” Lisa says. That night, Taylor had peppered her mom with questions: if he does this, will you adopt him? if he does that, will you adopt him? And now here Lisa was, waiting with White Paw in a cage beside her. The door opened. Rooney came straight to Lisa, ignoring the cat completely. As it turned out, he was afraid of the cat. “He passed the ‘White Paw Test’ with flying colors,” Lisa says. “At one point he had his paws on my chest and was looking into my eyes as if to say, ‘Please take me home.’” And so she did. Taylor adds, “Our big boy is a true goofball at heart. We love our Looney Rooney,” and she gives Petfinder her five-star rating.